From time to time I find myself looking back at my class notes from my undergraduate studies, just to brush up on a topic or two (usually when I am taking the graduate class on the subject matter). And I’ve begun to notice a trend while comparing my undergraduate and graduate notes. I’ve gotten lazier. That is, the notation I use to describe mathematics has gotten simpler. I think the reason for this is because there has been simply more material to write down, and less time for me to do it. I’ve seen professors at least double (sometimes triple) my age move faster with a white board marker then I can move on a treadmill. I have a tough time keeping up. So to keep up with them (aside from nagging them to slow down) I’ve started adopting a shorthand notation. But unlike the late Dr. Feynman, I’ve not come up with my own short hand notation . Instead I’ve just tried to incorporate what’s known as four-vector notation. Four vector notation is the notation of choice for quantum field theory. It allows a great simplification in how much you have to write (once you know the rules). Well that’s not astonishing in the least bit, I could have just as well labeled the point P.
Here we have a partial derivative with respect to time and the “del” operator (sometimes referred to as a nabla). 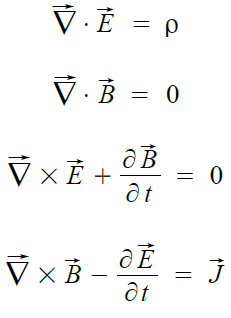 Notice how A and B have either a super-script or a sub-script in the above equations. In one case we have a contra-variant four-vector (super-script); and in the other we have a co-variant four-vector (sub-script). However, their components are always labeled with super-scripts. Notice how the product of four-vectors A & B is described by a “dot-product like” operation in which their respective components are multiplied together; but the last three are assigned a minus sign. Notice how A & B have index μ and C has index ν. The μ is the “repeated” index, and the four-vector product acts between A & B. I realize this isn’t a true summation because there is a minus sign involved, but that’s just what the process is referred as. 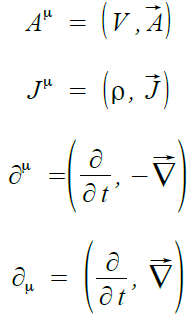 With these four equations-and appropriate boundary conditions-I can describe all phenomenon in classical electrodynamics (I chosen to work in Heaviside-Lorentz units as opposed to the standard SI system, this causes the pesky μ’s & ε‘s to drop out. Remember I’m lazy!!). Of course this is an awful mess when you look at it. Why on earth would anyone want to do this!? There are so many more terms and derivatives all over the place. (When I put this into Heaviside-Lorentz units the μ & ε again drop away). Let’s pause on this for a moment. I think this is really an astonishing miracle that physicists over the years have figured out how to write so much information about the natural world in such a small space (one line)! Some of you might remember the Standard Model Lagrangian, which is conveniently written on a coffee mug should you forget. That coffee mug contains A LOT of information, but it definitely cannot fit on one line, at least with my handwriting (maybe someone someday will come up with some ingenious notation of their own?!). But, just like that four vector notation has allowed physicists to simplify Maxwell’s Equations (all four of them) in a single concise statement. Talk about saving space on your final exam’s equation sheet! So hopefully you’ve come to appreciate the power of four-vector notation. Richard Feynman routinely used his own notation for trigonometric functions, logarithms and other common functions in mathematics, he did this because it was simpler & faster for him to write in such a fashion. For more details and other great stories, see Feynman’s own “Surely You’re Joking Mr. Feynman,” W. W. Norton & Company, Inc. 1985. See for instance D. J. Griffiths, “Introduction to Electrodynamics,” 2nd ed., Prentice-Hall, Inc., 1989.